Click on individual pictures for larger view. 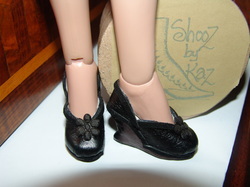 Black Leather with wedge heel, round toe and flower detail on the front to fit 17" Deanna Denton. Great little number to team with a Little Black Dress.